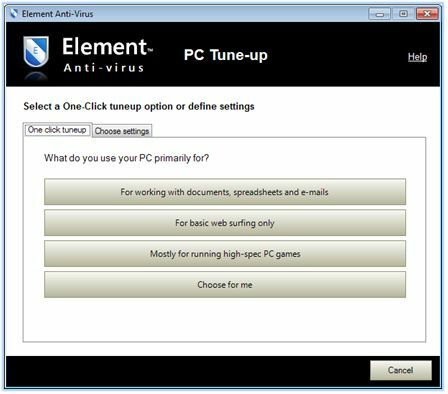 Element Anti-Virus provides maximum security for your computer, it is unobtrusive, resource friendly and most of all, very effective against viruses. 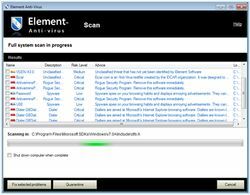 Element Anti-Virus 2011 was available as a giveaway on August 9, 2010! How would you improve Element Anti-Virus 2011? I Have never heard of this but they are nicrosoft registered partners so they must be ok.
Sheryl needs to read the text in BOLD at the top of this page for anyone to actually take her comment seriously: 'Please note that the software you download and install during the Giveaway period comes with the following important limitations: 1) No free technical support; 2) No free upgrades to future versions; 3) Strictly personal usage.' Duh. Unbelievable! Software said it was compatable with windows 7 32 bit when it was NOT. Compatatablitly wizard says it is not compatatable. I sent an email to Element the same day and they finally answer on Aug 31 stating that they will not support the product as given on giveaway of the day. Refuse to even address incompatatablity issue!!! Good thing I deleted it the same day and will NEVER consider purchasing this product! Poor attitudes, poor customer support and downright lying about the compatablity of their product! Poor way to run a business!!! Failed to install properly, then the next day reported as 'not activated', despite the GAOTD installer had activated it. The same basic issue on two machines (XP Pro/32) which had no conflicting software. Even the uninstaller had problems. DO NOT use this software, I sure won't! I tried to install this on my WinXp sp3 2 times and it wouldn't finish installing either time. The second time I left it going while watching TV, came back hours later and it still wasn't installed. That's when I quit and removed it. I tried to install this on my WinXp sp3 2 times and it wouldn't finish installing either time. The second time I left it going while watching TV, came back hours later and it still wasn't installed. That's when I quit and removed it. Would gladly do a critique of the product, except for: I tried to download and install the program seven times, totally un-installing between each effort. When it came to the pop-up boxes stating that the program was downloading additional plug-ins, or something like that, the displayed progress monitor bar never ceased (at least I let it run nearly seven hours on one trial.) Finally when I effected an interrupt by CTL+ALT+DEL the progress monitor broke away and the menu box opened, but it would NOT allow me to click on scan. This happened in each instance of my attempted download/installation. I gave up in exasperation. I'm not a pc guru by any stretch, but I have been working on and with pcs since 1982, so I am not exactly a novice, either. Sure wished that GOTD test-downloads and installations before posting them ... like Major Geeks does. Oh, well... better luck next time, eh? As I mentioned in my first post, only one AV product is running in real time, the others are effectively paused. I use the others to do periodic scans of my computers and to do individual scans of anything downloaded. I don't put all of my faith in a single product with a single point of failure. Robin, your theory is correct, but you may have heard it in reference to software based firewalls instead. For this you would need to take extra precautions as well. A router provides an excellent barrier btw. For Robin at #107. As I mentioned in my first post, only one AV product is running in real time, the others are effectively paused. I use the others to do periodic scans of my computers and to do individual scans of anything downloaded. I don't put all of my faith in a single product with a single point of failure. Robin, your theory is correct, but you may have heard it in reference to software based firewalls instead. For this you would need to take extra precautions as well. A router provides an excellent barrier btw.
" we need genuine feedback related to the our software only "
How about feedback related the company's PR? The reply you posted on Ashraf’s website is very childish. Not a very smart way to make your company look good.
" we need genuine feedback related to the our software only " How about feedback related the company's PR? The reply you posted on Ashraf’s website is very childish. Not a very smart way to make your company look good. Is this antivirus workable on Windows 2003 server by any chance? I am running one home server over here. And was wondering if it would work with that as well? While I concur that it's hard to go against established companies, the best a company can do would be to send it for benchmarking first. Benchmarks do tell a lot about the effectiveness of the software. 1 hour to go and still no servers up and webpage still slower than molasses in January. Clicking on System monitor brings up an unhandled exception error stating category doesn't exist. Is this a beta? I hope not. According to GAOTD this is supposed to be full version softs not beta and cripple ware I quote from the FAQ "We provide you with full-functioning registered version of software titles." Full-Functioning? This soft isn't either full or functioning. what gives? Nope . . doesn't look like it's going to happen. Bigger window says "Element Antivirus is being set up on your computer. This may take several minutes to complete" . . more like several hours or never! Smaller popup says "Please wait while we perform tests on the newly installed software. This should only take a few minutes." "Please do not turn off your computer or interrupt this process until it completes." "Downloading and installing product updates" (Not even installed yet! . . still running and probably won't stop for a few days) Green bars running everywhere and doing nothing. If the product won't install, I certainly don't need the product updates . . do I? Too bad . . I really wanted to try it out too. Oh well, maybe at some point in time you will figure out how to make software install and then do the updates. Never have ever seen this done this way before. Nope . . doesn't look like it's going to happen. Bigger window says "Element Antivirus is being set up on your computer. This may take several minutes to complete" . . more like several hours or never! Smaller popup says "Please wait while we perform tests on the newly installed software. This should only take a few minutes." "Please do not turn off your computer or interrupt this process until it completes." "Downloading and installing product updates" (Not even installed yet! . . still running and probably won't stop for a few days) Green bars running everywhere and doing nothing. If the product won't install, I certainly don't need the product updates . . do I? Too bad . . I really wanted to try it out too. Oh well, maybe at some point in time you will figure out how to make software install and then do the updates. Never have ever seen this done this way before. #93 I believe it is Stu correct? If not I apologize. I have a quick question about you running more than one virus scanner on your machine. I have always been told to only use one (1) software program for anti virus on my pc and one (1) spyware/malware per each pc,or it could be finding (reading) the virus's on other software you would be running. Do I have this correct. Or can you help me understand it better please. I have spybot and than also Avast. If for some reason #93 does not want to respond can anyone help me and let me know if I have this right or not. Also since this is new software is it beta? Thanks so much for helping. I will download and wait for someone to help me I just had to re install dont want to go thru that again right now. :) Boy I sure hope this is ok to ask here. #93 I believe it is Stu correct? If not I apologize. I have a quick question about you running more than one virus scanner on your machine. I have always been told to only use one (1) software program for anti virus on my pc and one (1) spyware/malware per each pc,or it could be finding (reading) the virus's on other software you would be running. Do I have this correct. Or can you help me understand it better please. I have spybot and than also Avast. If for some reason #93 does not want to respond can anyone help me and let me know if I have this right or not. Also since this is new software is it beta? Thanks so much for helping. I will download and wait for someone to help me I just had to re install dont want to go thru that again right now. :) Boy I sure hope this is ok to ask here. Thanks so much. Why on earth would you install updates in conjunction with the installation of the software? That's what it did when I tried to install it. You download and install updates after the software has been installed. Download went quickly . . I use IEPro for downloads. I have now downloaded the update from the site mentioned above but it will probably do the same thing again when I try to install the software because how is the software going to know any different. At first, I wasn't going to try it but since Avast failed me last week and let in the rouge virus anivir which took a day and a half to get rid of, thought it might work . .
but if you are not doing daily or at least every other day updates, it will not work because these things change daily. Avast updates automatically at least once a day if not more. Daily updates are totally necessary for a truly good antivirus. I will try this again but I have a feeling that the same thing is going to happen and the installation of the software hangs and runs and runs because the new window pops up with the update which should never be installed until after the software has been downloaded and installed completely. Definitely need to work on this. I would like to install it and use it but I guess probably not. If this happens again, I won't bother. Why on earth would you install updates in conjunction with the installation of the software? That's what it did when I tried to install it. You download and install updates after the software has been installed. Download went quickly . . I use IEPro for downloads. I have now downloaded the update from the site mentioned above but it will probably do the same thing again when I try to install the software because how is the software going to know any different. At first, I wasn't going to try it but since Avast failed me last week and let in the rouge virus anivir which took a day and a half to get rid of, thought it might work . . but if you are not doing daily or at least every other day updates, it will not work because these things change daily. Avast updates automatically at least once a day if not more. Daily updates are totally necessary for a truly good antivirus. I will try this again but I have a feeling that the same thing is going to happen and the installation of the software hangs and runs and runs because the new window pops up with the update which should never be installed until after the software has been downloaded and installed completely. Definitely need to work on this. I would like to install it and use it but I guess probably not. If this happens again, I won't bother. Requirement for .NET framework v2.0 leaves me out. BUT I APPLAUD THIS COMPANY FOR PUBLISHING CLEAR SYSTEM REQUIREMENTS!!! ...unlike so many other companies. Requirement for .NET framework v2.0 leaves me out. BUT I APPLAUD THIS COMPANY FOR PUBLISHING CLEAR SYSTEM REQUIREMENTS!!! ...unlike so many other companies. Avast is giving up the free version.It is now offering a 30 free trial and all existing customers are going to have to upgrade or lose it as far as I can see.Anyone else know about this?Better hurry and check,only a few hours left on this one. Okay after reading all of these comments I too am going to make a pass but I do want to point out something. "NOTE: Please do not believe what Ashraf said about the updates. He does not work for Element Software, and therefore has no knoweldge of how updated Element Anti-Virus is. These updates were released on 1st August 2010"
Hello today is August 9 2010, that means your updates are 8 days out of date. And since new virsus come out daily that means you would miss alot of them. So again I believe I will pass. Okay after reading all of these comments I too am going to make a pass but I do want to point out something. For Mr. Jakeson you say that Ashraf should not be paid attention to, as you put it "NOTE: Please do not believe what Ashraf said about the updates. He does not work for Element Software, and therefore has no knoweldge of how updated Element Anti-Virus is. These updates were released on 1st August 2010" Hello today is August 9 2010, that means your updates are 8 days out of date. And since new virsus come out daily that means you would miss alot of them. So again I believe I will pass. This is my first comment on GOTD though I'm here lurking often. This is NOT AntiVirus software... it INSTALLS viruses; 4 to be exact! I am already using Avast Premium and my system is clean; MalwareBytes confirms as does Spyware Terminator and Avira. Do NOT download this garbage called "Element Anti-Virus 2011"
It has a nice GUI etc... but it's quite sickening that the developers would deliberately infect a system in an effort to make us "think" that it's a superior product when in fact it's trash! This is my first comment on GOTD though I'm here lurking often. This is NOT AntiVirus software... it INSTALLS viruses; 4 to be exact! I am already using Avast Premium and my system is clean; MalwareBytes confirms as does Spyware Terminator and Avira. Do NOT download this garbage called "Element Anti-Virus 2011" It has a nice GUI etc... but it's quite sickening that the developers would deliberately infect a system in an effort to make us "think" that it's a superior product when in fact it's trash! @Jack Jackson - I had to work late today otherwise I would have had more time to work with the product. I believe your product has potential, however, as I see it the weakest link in the chain (so to speak) is the Help file which seems vague, too generic. Given how heavy the marketplace is with security programs, setting one program over another is features; or in other words, uniqueness. Well Jake here is my offer: I install and run your software, you guarantee in writing that if your product effs up my comp you will personally pay to fix it. I expect a resounding NO to that offer. Have you no faith in your product? Are you just ginning up scare tactics to grab a quick pound? Hmmmm, let's see. No update support since offer began(still cannot update it has been 18 hours) Your servers are down at a "critical time". (Hope there isn't a critical virus update needed in the future or that your customers consider their protection "critical") Does your company have dedicated secure servers for the updates like almost all other companies have? So after 12 hours of scanning 28 problems listed and all were repeated numerous times all were false positives related to mfc71.dll uninstallers read me files msvcr71.dll and zib.dll. All legit files. The readme file was from avidemux your software registered it as Dialer, keylogger, and adware. Wow what a powerful 2 byte txt file. The scan is slow, the results are dubious, and the program is difficult to customize. clicking on settings only gives minimal options no selection of specific areas to scan etc.. There is no mention of the database date signature just a blurb about me being protected, even said that before I manually updated. Now that is security it just says so. Jakey you suffer from an affliction many in the corporate software industry seem to have, "no tact". Really, is it necessary to slam Ashraf as a "supposed" reviewer with "unreliable" information? Simply state the review isn't for the described product. Insecurity aside, there is an adage that states you don't defecate where you eat. You obviously felt Ashraf's "review" would hurt your products chances so you lash out at him personally? Is this how you do business? If a customer has a problem you berate them? Wow. Where do I sign up? Let me know about that offer, is it a deal? Well Jake here is my offer: I install and run your software, you guarantee in writing that if your product effs up my comp you will personally pay to fix it. I expect a resounding NO to that offer. Have you no faith in your product? Are you just ginning up scare tactics to grab a quick pound? Hmmmm, let's see. No update support since offer began(still cannot update it has been 18 hours) Your servers are down at a "critical time". (Hope there isn't a critical virus update needed in the future or that your customers consider their protection "critical") Does your company have dedicated secure servers for the updates like almost all other companies have? So after 12 hours of scanning 28 problems listed and all were repeated numerous times all were false positives related to mfc71.dll uninstallers read me files msvcr71.dll and zib.dll. All legit files. The readme file was from avidemux your software registered it as Dialer, keylogger, and adware. Wow what a powerful 2 byte txt file. mfc71.dll is used by .net and is a Microsoft authored item without it .net wont work. (Isn't your software based on the .net framework? I foresee a problem here) The scan is slow, the results are dubious, and the program is difficult to customize. clicking on settings only gives minimal options no selection of specific areas to scan etc.. There is no mention of the database date signature just a blurb about me being protected, even said that before I manually updated. Now that is security it just says so. Jakey you suffer from an affliction many in the corporate software industry seem to have, "no tact". Really, is it necessary to slam Ashraf as a "supposed" reviewer with "unreliable" information? Simply state the review isn't for the described product. Insecurity aside, there is an adage that states you don't defecate where you eat. You obviously felt Ashraf's "review" would hurt your products chances so you lash out at him personally? Is this how you do business? If a customer has a problem you berate them? Wow. Where do I sign up? Let me know about that offer, is it a deal? Had 1 file that did not want to be removed.... hee hee got the sucker anyway. So far, you have provided us with an Anti Virus Software that does not install correctly from the links on this site, and information about how to fix it. Not bad. You have told us to comment ONLY on your program, and not bother you with comments about other programs as your program so far has not had the time to build any reputation. You say you do not have a reputation yet? Because I definitely think you DO have a reputation, right about NOW. Well, mr. Jackson So far, you have provided us with an Anti Virus Software that does not install correctly from the links on this site, and information about how to fix it. Not bad. You have told us to comment ONLY on your program, and not bother you with comments about other programs as your program so far has not had the time to build any reputation. Are you sure you have thought this through? So far, you obviously did not do the necessary research of GAOTD, to see how many would probably download your program. Statistics would have been helpful here, and I am sure the GAOTD-team would have told you about previous security-systme-downloads. Then, moving the updates to a faster server for the time being, or at least in some way being prepared for the massive downloads/installs might have been a good idea You say you do not have a reputation yet? Are you sure? Really sure? Because I definitely think you DO have a reputation, right about NOW. Didn't work for me. Acted like it was installing and downloading updates, but after 30 minutes nothing. Then I downloaded the update file and it seemed like it worked, but the program still didn't install correctly for the update to work. Pass on this one. I have had good success with MSE so I will stick with it. This is my first GOTD product I just couldn't get to work. I'll pass on this company in the future. Didn't work for me. Acted like it was installing and downloading updates, but after 30 minutes nothing. Then I downloaded the update file and it seemed like it worked, but the program still didn't install correctly for the update to work. Pass on this one. I have had good success with MSE so I will stick with it. This is my first GOTD product I just couldn't get to work. I'll pass on this company in the future. Sorry, but when a company starts criticizing a past review from someone we know as pretty reliable, it raises my hackles. Reliable? Really? And here I was thinking when I read their comments that finally someone else has got this guy's number. Why anyone gives this newbie any credence at all when all he does is pimp his own website with hastily thrown-together reviews, I've no idea. Give me a fubar post any day. It is very very rare that I feel compelled to to air my views and let my voice be heard; however as computer security and safety is somewhat of a passion I shall attempt to give some thought to the software and the other comments. I shall start out by stating that I have not installed the software and will therefor not comment about its abilities or lack thereof. 1. The very first comment at the top of the page takes very good care to mention how its product is brand new and has not had time for any reviews or field tests. Fair enough, but should we take this at face value? The commentor is an employee of the company and is expected to be biased (ie. favourable - not two assed) towards it. I would be the same. 2. There is no single anti-virus product out on the market which can guarantee removal of all known viruses. I have several AV programs on my computer; including NOD32, online armour++ and sophos. However I only have the NOD32 running in realtime and use the others for a weekly scan. 3. Anti virus software is designed primarily for ....... the removal and detection of viruses. A product may help somewhat in the removal of other types of malware (trojans, rootkits, spyware ...) but to be safe I would recommend using software specific to each type of illness. If you want to try out this software, then by all means do so. Any installation will be at your own risk - as it would with any software and personally I would have it running alongside some other AV software just to be sure. Every comment made on this site is a personal opinion. True, there may be some fact too but still .... many many opinions. I hope you have found this comment of some usefulness. Remember, in computer security it is far far better to be proactive rather than reactive. lock the doors and batten down the hatches before the horror comes. Once per month is NOT even close to enough for updates, even for malware! m'kay..tried installing several (about 7) times but hangs on 'downloading and installing product updates'. So, tried installing updates etc through link mentioned @1. Unfortunately impossible to install. Thumbs down for this GAOTD!! Hi Jake, here's some feedback-I installed it and you only give 'exit and restart' as a way out, you should have exit w/o restart as an option. Then after restart, it doesn't run. I checked msconfig and I see one item in startup is there but stopped, and hey, it's called 'element totalprotect', the very thing you say this isn't. So change the file name so you fool more people. I was happy to give it a try, but it would have to run first. Back to AVG. I gave several thumbs down for silly comments, but the positive went 7 up instead!!! Do people read before they start to make silly remarks? or how come that tey confound AV and total protect? At least half of the commentators have not read or understood comment #1!!! Will give it a try after creating a checkpoint. I gave several thumbs down for silly comments, but the positive went 7 up instead!!! Do people read before they start to make silly remarks? or how come that tey confound AV and total protect? At least half of the commentators have not read or understood comment #1!!! Will give it a try after creating a checkpoint. I think there are 3 categories to consider when looking at AV software -- Effectiveness, Compatibility, & Usability... problems in any one of the 3 can make any anti-malware next to useless. As far as judging 1 & 2, Effectiveness & Compatibility, Element Anti-Virus 2011 needs to get out there, needs to get installed & used on a lot of PCs/laptops, which is what they're doing here today. It took lots of users having problems to solidify Norton's reputation for terrible compatibility, just like it took lots of installs before Avast, Kaspersky, & AVG etc became familiar names. As far as usability goes, Element Anti-Virus 2011 reminds me of Microsoft's OneCare [which after being pulled from store shelves last year, ended AFAIK this month]. It's *much* simpler, much easier to navigate than McAfee Total Protection 2010 for example, but on the flip side, it doesn't allow all the settings & customization available in McAfee either. And today's GOTD includes defrag, file backup, & system optimization along with it's AV duties. In the past I've used CA, Trend, McAfee, OneCare, Avast, & AVG. Removing OneCare was work, uninstalling McAfee was/is a chore, but nothing compared to getting rid of Norton, & absolutely a walk-in-the-park compared to CA -- personally I'm not sure it's even possible to get rid of all the effects of installing CA. Because of those [mostly bad] experiences uninstalling, I'm maybe overly cautious when it comes to trying out AV apps/packages. Running the GOTD Setup.exe, after phoning home installation files are placed in Prog. Files \ ElementAntiVirus2011GOTDSetupPackage\ . As already posted by others, install may hang a bit trying to download the latest updates -- as in the 1st comment, a separate update [.msi] file is available, but I didn't see a graceful way to stop the install to run it... taking a guess at which Element file/process to end in Task Mgr, once I got the right one I briefly saw a setup finished window before XP automatically re-booted. Element Anti Virus 2011 itself installs under Docs & Settings \ [UserName] \ App. Data \, with additional files/folders under My Docs -- Docs & Settings \ [UserName] \ App. Data \ Microsoft \ Installer \ -- Docs & Settings \ [UserName] \ Local Settings \ App. Data \ -- 4 .msi files in Windows \ Installer \ -- & a .xml file in the system folder. There were a lot of registry adds, what with using the Microsoft Windows Installer & including defrag, backup, & optimization components, but less than McAfee & CA. I couldn't tell all that much from running the Element Anti Virus 2011, but I was concerned with 2 things looking through Help... 1) it was the 1st time I remember having a fair amount of CPU usage reading a help file -- it acted like help may have been compiling while I was waiting for it to display all the pages/content -- & 2) there was a passage about Inoculation, saying once you ran it, it would be impossible for your PC to reach problem web sites... I can see where that might be useful, but if things didn't work as planned I could see it causing problems too. I think there are 3 categories to consider when looking at AV software -- Effectiveness, Compatibility, &amp; Usability... problems in any one of the 3 can make any anti-malware next to useless. 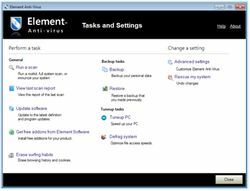 As far as judging 1 &amp; 2, Effectiveness &amp; Compatibility, Element Anti-Virus 2011 needs to get out there, needs to get installed &amp; used on a lot of PCs/laptops, which is what they're doing here today. It took lots of users having problems to solidify Norton's reputation for terrible compatibility, just like it took lots of installs before Avast, Kaspersky, &amp; AVG etc became familiar names. As far as usability goes, Element Anti-Virus 2011 reminds me of Microsoft's OneCare <em>[which after being pulled from store shelves last year, ended AFAIK this month]</em>. It's *much* simpler, much easier to navigate than McAfee Total Protection 2010 for example, but on the flip side, it doesn't allow all the settings &amp; customization available in McAfee either. And today's GOTD includes defrag, file backup, &amp; system optimization along with it's AV duties. In the past I've used CA, Trend, McAfee, OneCare, Avast, &amp; AVG. Removing OneCare was work, uninstalling McAfee was/is a chore, but nothing compared to getting rid of Norton, &amp; absolutely a walk-in-the-park compared to CA -- personally I'm not sure it's even possible to get rid of all the effects of installing CA. Because of those [mostly bad] experiences uninstalling, I'm maybe overly cautious when it comes to trying out AV apps/packages. Running the GOTD Setup.exe, after phoning home installation files are placed in Prog. Files \ ElementAntiVirus2011GOTDSetupPackage\ . As already posted by others, install may hang a bit trying to download the latest updates -- as in the 1st comment, a separate update [.msi] file is available, but I didn't see a graceful way to stop the install to run it... taking a guess at which Element file/process to end in Task Mgr, once I got the right one I briefly saw a setup finished window before XP automatically re-booted. Element Anti Virus 2011 itself installs under Docs &amp; Settings \ <em>[UserName]</em> \ App. Data \, with additional files/folders under My Docs -- Docs &amp; Settings \ <em>[UserName]</em> \ App. Data \ Microsoft \ Installer \ -- Docs &amp; Settings \ <em>[UserName]</em> \ Local Settings \ App. Data \ -- 4 .msi files in Windows \ Installer \ -- &amp; a .xml file in the system folder. There were a lot of registry adds, what with using the Microsoft Windows Installer &amp; including defrag, backup, &amp; optimization components, but less than McAfee &amp; CA. I couldn't tell all that much from running the Element Anti Virus 2011, but I was concerned with 2 things looking through Help... 1) it was the 1st time I remember having a fair amount of CPU usage reading a help file -- it acted like help may have been compiling while I was waiting for it to display all the pages/content -- &amp; 2) there was a passage about Inoculation, saying once you ran it, it would be impossible for your PC to reach problem web sites... I can see where that might be useful, but if things didn't work as planned I could see it causing problems too. Hoorah and kudos for Post No. 1 from Jake Jackson from Element Software!! I have been visiting GAOTD daily for at least 2 years, and this is the first time I have seen the software provider lead off with Post No. 1 and additional information about the product being offered. I suggest that GAOTD require, or at least ask for, comments from every software provider using GAOTD's service and lead off the daily offering with those comments. Now, then. Even though I greatly appreciate Post No. 1, I will not be downloading or evaluating Element Anti-Virus 2011. First, there are too many posts about the same problems in the product, and second, Jake Jackson has not addressed any comments about the negative comments in additional posts. I hope GAOTD makes Element Anti-Virus 2011 available again, after the negative comments have been addressed and corrected. Maybe Element Anti-Virus 2012?? My thanks to GAOTD, Element Software, and all of the posters commenting on today's offering. Hoorah and kudos for Post No. 1 from Jake Jackson from Element Software!! I have been visiting GAOTD daily for at least 2 years, and this is the first time I have seen the software provider lead off with Post No. 1 and additional information about the product being offered. I suggest that GAOTD require, or at least ask for, comments from every software provider using GAOTD's service and lead off the daily offering with those comments. Now, then. Even though I greatly appreciate Post No. 1, I will not be downloading or evaluating Element Anti-Virus 2011. First, there are too many posts about the same problems in the product, and second, Jake Jackson has not addressed any comments about the negative comments in additional posts. I hope GAOTD makes Element Anti-Virus 2011 available again, after the negative comments have been addressed and corrected. Maybe Element Anti-Virus 2012?? My thanks to GAOTD, Element Software, and all of the posters commenting on today's offering. "An AV that didn’t impose a principle-based idea of trojans and end up deleting useful tools would rank HIGH on my list of alternatives!" I completely agree that antivirus software that automatically deletes what it considers "malware" without giving the user a say in the process is hard to use, hard to trust, and a major time waster. Automatically deleting your software without your permission is a major headache that I can do without. That course of action causes one to have to go back and reinstall the rogram followed by chasing down the mechanism and then telling the antivirus software to ignore the program that it recently deleted. In case the GOTD software and similar promotional giveaways you have no chance of reinstalling the deleted program. In the last few months I have had the antivirus products from "Panda", "Comodo" and "Symantec - Norton Antivirus" perfectly safe programs that I have not been able to replace. @46 "An AV that didn’t impose a principle-based idea of trojans and end up deleting useful tools would rank HIGH on my list of alternatives!" I completely agree that antivirus software that automatically deletes what it considers "malware" without giving the user a say in the process is hard to use, hard to trust, and a major time waster. Automatically deleting your software without your permission is a major headache that I can do without. That course of action causes one to have to go back and reinstall the rogram followed by chasing down the mechanism and then telling the antivirus software to ignore the program that it recently deleted. In case the GOTD software and similar promotional giveaways you have no chance of reinstalling the deleted program. In the last few months I have had the antivirus products from "Panda", "Comodo" and "Symantec - Norton Antivirus" perfectly safe programs that I have not been able to replace. Like a several others, I look at most of the GOTD offerings, DL those that interest me. Not all do, obviously, but one thing I ALWAYS look for is Ashraf's review. If it's either missing, or not positive, I don't even consider going further. Don't know the person online or off, but they seem to know their stuff, and that's critical to me. So, when the claimed author/employee of the offering company starts with: "Don’t base your opinions on Ashraf’s supposed review. It’s not a new review; it contains information that is a direct copy and paste of the review of Element Total Protect 2010. I’ve also highlighted areas of the review that contains incorrect information, so it’s highly unreliable." Seems to me that in a totally unnecessary slam and insult to Ashraf, they should have attempted to contact Ashraf directly to get a 'new' review. Instead, just slam away at someone that many of us have placed a great deal of trust in. Bad move, very bad move, IMO. I use MS Security Essentials and Norton 360. Have Win 7 Home Premium. As always, Thanks indeed to the GOTD team. I may not use all that is offered, who does, but it beats the heck out of trying to hunt down any/all potential free offerings of software I might find useful. Like a several others, I look at most of the GOTD offerings, DL those that interest me. Not all do, obviously, but one thing I ALWAYS look for is Ashraf's review. If it's either missing, or not positive, I don't even consider going further. Don't know the person online or off, but they seem to know their stuff, and that's critical to me. So, when the claimed author/employee of the offering company starts with: "Don’t base your opinions on Ashraf’s supposed review. It’s not a new review; it contains information that is a direct copy and paste of the review of Element Total Protect 2010. I’ve also highlighted areas of the review that contains incorrect information, so it’s highly unreliable." Seems to me that in a totally unnecessary slam and insult to Ashraf, they should have attempted to contact Ashraf directly to get a 'new' review. Instead, just slam away at someone that many of us have placed a great deal of trust in. Bad move, very bad move, IMO. I use MS Security Essentials and Norton 360. Have Win 7 Home Premium. Haven't had any issues with the current setup, and don't plan on changing. Believe that for security purposes, it's money well spent to buy a commercial product. Just my opinion, but it's my money, so...... As always, Thanks indeed to the GOTD team. I may not use all that is offered, who does, but it beats the heck out of trying to hunt down any/all potential free offerings of software I might find useful. I totally agree with you Charles. Online Armor is one of the best (IF NOT THE BEST) GOTD i have ever downloaded. I'm saving up real cash to renew my subscription come Febuary. then the computer locked up. I had to do a restore to get it to run correctly. Tried to get on the website but no response. Couldn't get it to install. Came back with an error, then later a message that it was installed ( but it wasn't) then the computer locked up. I had to do a restore to get it to run correctly. Tried to get on the website but no response. It is Night time in the UK so maybe tomorrow they will fix this. So I finally got it to install. If your having trouble with the updating process do what I did...walk away and come back 2 hours later and it will have errored out with a popup that says something about not finding a url. Then click ok and it says finished and its installed. Then you have the run the update msi located in post number 1. But I am prone to believe this is bogus as I too got somekind of AntiVersminsPRO infection on a virtual machine not connected to anything and Clean install. Some winsock.dll infection which happened to be 3 hits on the same file location. This is simply junk. @#67 Are you part of that DE Team in post 11? Q_Q If you dont compare it to something then you don't know how good the product is. If a manufacture doesn't want you comparing their product then they probably know already that their product isn't worth the code it's written in. Tried to install on Windows 7- 64 bit. No success. It showed some error, after that- some window for updates. I went shopping, and after 2 hours- same situation still updating! Definitely can’t trust to “antivirus”, who can’t even install correctly. I am speechless about the update process. And at the top of everything- it is not free! This software is “Must not have it”! Sorry, Mr. Jack Jakeson- you have a lot more to work. Tried to install on Windows 7- 64 bit. No success. It showed some error, after that- some window for updates. I went shopping, and after 2 hours- same situation still updating! Definitely can’t trust to “antivirus”, who can’t even install correctly. I am speechless about the update process. And at the top of everything- it is not free! Just for the record- before to install this “antivirus”, the PC was clean- no other security software installed… This software is “Must not have it”! Sorry, Mr. Jack Jakeson- you have a lot more to work. Hope GOTD team can get Online Armor as a giveaway again! I find Online Armor reliable, effective and doesn't eat up CPU time! Ashraf has technical knowledge, and I'm sure he does try the software out himself. He criticizes how well your company produces new updates for the software (and I mean anti-virus database updates). If the log on your website is incorrect, then fix it! Anyways, I would like one updated every day, not every month... otherwise, virus makers would be a month ahead instead of a day ahead! It doesn't matter how much you claim a product is "different" than another product you sell: it still made by your company. I do believe they're different, but I'm sure there is still some parts that are similar. There are so many anti-virus products out there. You can even get anti-virus software for free! Of course, the free ones don't have so many features compared to the ones you pay for, but as for your anti-virus protection, that's all that matters. (And most anti-virus software also catch spyware too.) I recommend Microsoft Security Essentials along with McAfee Siteadvisor. I'll try this program later today, but I'm not expecting much. Heuristics rely on suspicious program behavior, and usually generate a lot of false positives. A few things for Jack Jakeson: Ashraf has technical knowledge, and I'm sure he does try the software out himself. He criticizes how well your company produces new updates for the software (and I mean anti-virus database updates). If the log on your website is incorrect, then fix it! Anyways, I would like one updated every day, not every month... otherwise, virus makers would be a month ahead instead of a day ahead! It doesn't matter how much you claim a product is "different" than another product you sell: it still made by your company. I do believe they're different, but I'm sure there is still some parts that are similar. There are so many anti-virus products out there. You can even get anti-virus software for free! Of course, the free ones don't have so many features compared to the ones you pay for, but as for your anti-virus protection, that's all that matters. (And most anti-virus software also catch spyware too.) I recommend Microsoft Security Essentials along with McAfee Siteadvisor. I'll try this program later today, but I'm not expecting much. Heuristics rely on suspicious program behavior, and usually generate a lot of false positives. To all, this is very important, so please read. There are indeed issues today. Of all days, our website is experiencing connectivity issues, hence the installation is taking longer than expected. This is NOT normal behaviour. We believe there have been so many installations in this one day that the Element Software server has had trouble coping with the distrubution of the updates. Here are specific instructions in getting your copy of Element Anti-Virus working. Please read them carefully. 1.Download GOTD's installer for Element Anti-Virus. NOTE: Please do not believe what Ashraf said about the updates. He does not work for Element Software, and therefore has no knoweldge of how updated Element Anti-Virus is. These updates were released on 1st August 2010. -Right click your Windows Taskbar and select Task Manager. If you are running Windows Vista or Windows 7, you will need to additional click 'Show for all users'. End the ElementSoftware.AntiVirus.Update.exe task from the Processes tab. -Now this process has been ended, the installer will now finish. Do not click Restart just yet. 4.Run the InstallLatestDefinition.msi package and follow the instructions provided. 5.You will now be able to use Element Anti-Virus successfully. Thank you all for your patience and feedback. To all, this is very important, so please read. There are indeed issues today. Of all days, our website is experiencing connectivity issues, hence the installation is taking longer than expected. This is NOT normal behaviour. We believe there have been so many installations in this one day that the Element Software server has had trouble coping with the distrubution of the updates. Here are specific instructions in getting your copy of Element Anti-Virus working. Please read them carefully. 1.Download GOTD's installer for Element Anti-Virus. 2. Download our latest installer for the updates : http://elementsoftware.hostoi.com/InstallLatestDefinition.msi NOTE: Please do not believe what Ashraf said about the updates. He does not work for Element Software, and therefore has no knoweldge of how updated Element Anti-Virus is. These updates were released on 1st August 2010. 3.Begin the installer, and wait for it to get to the 'downloading update' step. If this step freezes, or takes an extra long time, simply; -Right click your Windows Taskbar and select Task Manager. If you are running Windows Vista or Windows 7, you will need to additional click 'Show for all users'. End the ElementSoftware.AntiVirus.Update.exe task from the Processes tab. -Now this process has been ended, the installer will now finish. Do not click Restart just yet. 4.Run the InstallLatestDefinition.msi package and follow the instructions provided. 5.You will now be able to use Element Anti-Virus successfully. Thank you all for your patience and feedback. It doesn't take a rocket scientist,to read these reviews and realize that this product is just not ready for prime time. I don't want virus protection that may or may not install.Or may or may not work. Or may or may not keep working. Other then the four viruses that come with the program no one has stated categorically that it does any good. EXCEPT some guy from the company trying to off load it! Also one other guy that was so insistent you could almost read HE needed you to use it. I download and up load,cruise the web, daily yet my computer is clean and functioning well. I use ........... and it is free updates regular and by the way installed on the very first try. so thanks gotd, but on this I see no reason to bother with it. I wont swap something that has been working perfectly, for something that may not work at all! Thank you jake jackson and element software for your comments and participation here. I have tested this product and find it to be a worthy addition too my computer. A couple small glitches but not a deal killer. Congratulations on having the guts to comment on what many of us know as totally "UNRELIABLE" so called reviews. It is a shame it is allowed to continue. Thank you jake jackson and element software for your comments and participation here. I have tested this product and find it to be a worthy addition too my computer. A couple small glitches but not a deal killer. Congratulations on having the guts to comment on what many of us know as totally "UNRELIABLE" so called reviews. It is a shame it is allowed to continue. Thanks for a good product. Complete BS! Wouldn't install at all (W7-64bit) Extremely disappointed!!!! So far I like it! A little different than other antivirus software I ahve used, so it is hard to compare it. For free, wow, it works great, installed fine, and scans well! Found 1 virus that went undetected by AGV. For some reason I found no reviews on it other than Element Total Protect. It seems, this software must be very new! It is a keeper, but the $40.00 price is rather high I think! Time will tell if it is good or great!! "What the heck is going on here today???!!!" Mr. Jackson's "comment" has moved to first place while Ashraf's got demoted by one place? On dotTech Mr. Jackson has not yet given any explanations but only ventilated his frustration about a not so positive review. While he says here that "it contains information that is a direct copy and paste of the review of Element Total Protect 2010." - which is in many respects true - he has not, by any means, provided information or proof to the fact that today's offer is a substantial improvement to the product Ashraf reviewed last time. Ashraf is renown for his accuracy and high quality reviews, and deserves proper riposte in stead of what Mr. Jackson utters here (and on dotTech). Mr. Jackson, the proof of the cake etc... Some people here have (tried to) taste it. Hi, Reading these comments ànd following dotTech (Ashraf) I have a question that needs urgent reply by a unbiased party: "What the heck is going on here today???!!!" Mr. Jackson's "comment" has moved to first place while Ashraf's got demoted by one place? On dotTech Mr. Jackson has not yet given any explanations but only ventilated his frustration about a not so positive review. While he says here that "it contains information that is a direct copy and paste of the review of Element Total Protect 2010." - which is in many respects true - he has not, by any means, provided information or proof to the fact that today's offer is a substantial improvement to the product Ashraf reviewed last time. Ashraf is renown for his accuracy and high quality reviews, and deserves proper riposte in stead of what Mr. Jackson utters here (and on dotTech). Mr. Jackson, the proof of the cake etc... Some people here have (tried to) taste it. Perhaps I will have a go at it too. When you feel like furnishing real arguments I might indeed decide to give it a try, but I doubt you will be able to rise above the level you have set... Greetz. Patrick.